Note: Please scroll down to the comments section to see a reader's comment that this was indeed the calling card of the Professor Ira O. Wade described below. Vintage calling card of Mr. Ira O. 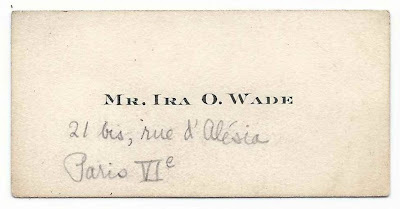 Wade, who appears to have been living, at least temporarily, at 21 bis, rue d'Alesia, Paris, in what I assume was the 6th arrondisement. The 1930 Census of Princeton, New Jersey, shows an Ira O. Wade and wife Mabel. His occupation was listed as teacher at a university. He was Dr. Ira Owen Wade, a member of the Foreign Languages Department, an authority on Voltaire and the founder of Princeton's Program in European Civilization. Mabel Wade was the former Mabel Harrington, I believe. More information about Ira Owen Wade's life and career is available here on the Find-a-Grave site. It seems very plausible that the card belonged to this Ira O. Wade, before he attained his doctorate in 1924, and that he was on sabbatical at Paris, where he was researching one of his works or teaching. 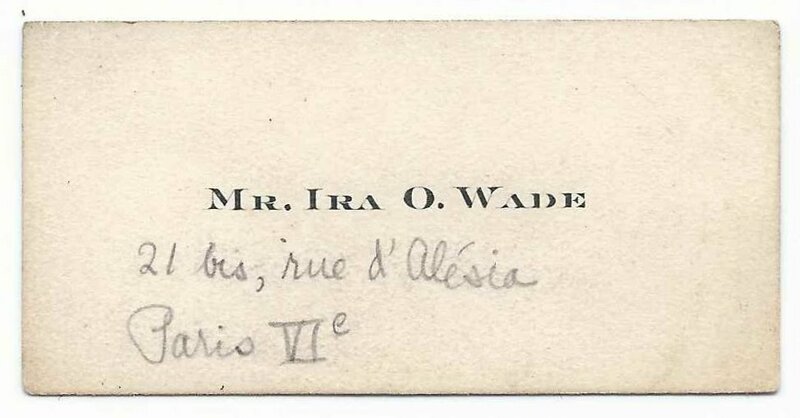 If you have more information on Dr. Ira Owen Wade or believe that this card belonged to another Ira O. Wade, please leave a comment or contact me directly. Thanks! Thanks for your comment confirming that this is the card of Professor Wade.